Over recent months we’ve been speaking to NHS trusts at different stages of the journey to becoming tobacco-free. Implementing smokefree grounds is something that some have struggled with, but there are useful learnings out there too. Now we need to get them accustomed to not expecting to smoke anywhere on NHS premises. Hospitals are health promoting environments for all and cannot be a place for a behaviour that leads to the illness and death of so many. 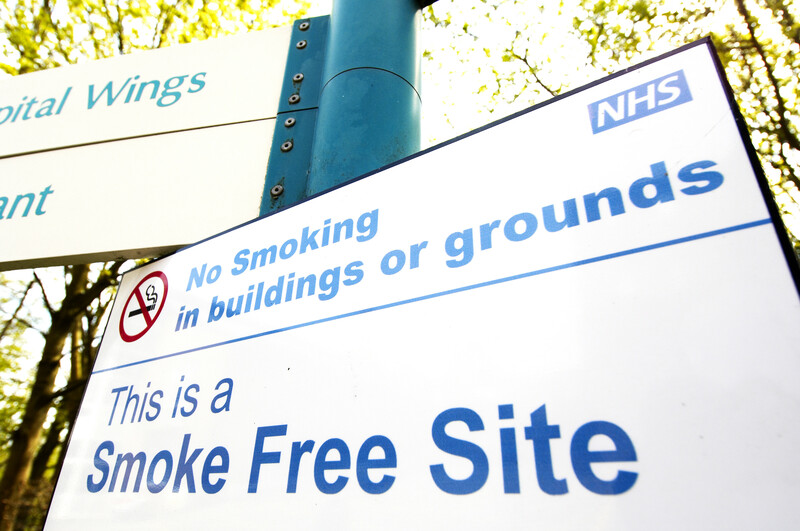 Implementing smokefree sites will present differing challenges to different hospital trusts, however the experience of the early adopters shows it can be done. The reasons for going tobacco free – and the potential outcomes for individuals and families, for patients and for NHS staff – should be compelling for anyone working to improve health and deliver care. Smoking remains the leading cause of premature death in the UK and is responsible for half of the health gap between the poorest and most affluent communities. We can reach millions of smokers with stop smoking support through our health services – a quarter of all patients occupying beds in acute hospitals smoke. This is an opportunity that we must embrace and act upon, not only to reduce the huge burden of smoking on the NHS, but to reduce health inequalities and save lives. How can we enforce a no smoking policy across the grounds? The easier you make compliance, the less you depend on enforcement. Staff, patients and visitors should be given sufficient advance warning and clear information so they know what to expect. Many smokers find e-cigarettes helpful for quitting and staying smokefree and they carry a fraction of the risk of cigarettes. Allowing vaping in all or part of the hospital grounds can support compliance with the smokefree policy. Making sure a choice of fast acting nicotine replacement therapy is available over the counter from the hospital shop can also help by providing effective treatment of withdrawal. Obviously, good signage is essential and trusts could consider following the example of Medway NHS Foundation Trust, which created a team of volunteer ‘smokefree champions’ to support smokefree grounds. The champions are trained to offer practical advice on stopping smoking and can signpost people to quitting support. Going tobacco-free is about much more than requiring smokers to stand on the other side of the fence to smoke - it is primarily about helping patients and staff who smoke to quit. There will be initial set-up costs, including new signage, possibly the removal or “repurposing” of existing smoking shelters, creation of communications resources and so on. Investment may also be needed to put in place improved access to quitting support. However with fewer hospital admissions, shorter inpatient stays and reduced staff sickness absence, the net financial gains to individual trusts and the NHS overall over the medium and longer term will be substantial. Hospital patients and their families are going through stressful times – won’t we be seen as lacking compassion? The key here is changing expectations. At the moment, hospital trusts have differing policies on smoking and this leads to confusion. With a consistent approach across the NHS, everyone will understand that smoking can’t be allowed or facilitated in a place where they, or their loved ones, have come to get well. Alongside this, it needs to be made easier for people to comply with the smokefree policy. Should they need it, hospital inpatients should be provided with immediate support for temporary abstinence, and all patients and staff who smoke should have access to quitting advice and support, including the option of referral for specialist help. A policy that allows vaping in areas where smoking is not allowed also supports smokers to stay smokefree while on site. NICE has provided guidance on how to use nicotine replacement therapy to support “temporary abstinence” from smoking. Won’t having to leave the grounds mean staff take longer breaks to smoke? A tobacco-free trust should be doing all it can to help its staff who smoke to quit or, for those who aren’t ready to stop in one step, to reduce the harm from smoking. Over time, it can be expected that the number of people requesting smoking breaks will reduce. Policies that make it a more convenient choice to vape than to smoke can support staff in staying smokefree and help keep them onsite during working hours. What if having people smoking outside the hospital perimeter brings its own problems? Some hospitals may encounter issues such as nuisance to neighbouring residential or business premises from cigarette litter. A vaping policy that makes it an easier and more convenient choice to vape than to smoke. Our advice on e-cigarette use in public places provides organisations with some key evidence-based principles to follow. Whatever the challenges in implementing smokefree sites and ultimately a tobacco-free NHS, the bottom line is clear: it should never be the job of the NHS to support smokers to smoke. Smoking is a legal pastime , it is not your job to tell or to force people to stop smoking even when you have the power to do so. Encouraging patients and visitors by allowing e-cig use inside and outside your premises would accomplish your aims in a much less draconian manner without the angst and distress caused by compulsion. No one is being told they can't smoke. They're just being told to smoke elsewhere outside of the hospital grounds. Power corrupts? Tobacco corrupts. I don't want to inhale your fumes on my way into work, thanks. But the guidelines here do say that the overall aim is to stop staff and patients from smoking. Iv'e just been looking for a bit more info on all this as the hospital i work at has fully implemented a smoke free policy and i am no longer allowed to smoke at all while on duty whether on or off site. What i do helps me relax from a stressful job. with our 1% pay freeze for public sector workers my wages are reducing in real terms year on year due to an increased cost of living. The raising of my council tax this year alone is more that im getting from my wage increase right off the bat. Not even taking into account and rising food/ fuel/ rent prices. Working for the NHS is miserable and this is just another ideal being imposed upon us. I honestly feel sorry for some of the older patients who just want to have dignity of making there own health choices towards the end of their life. The food is better in a prison, and at least you can get a fag even if it smells suspiciously of someones chocolate alleyway. I support the campaign to support people to stop smoking fully and having being a smoker for >30yrs have tried several times to stop. However, having manged to stop with the use of Vaping I felt this would alleviate the problems of smoke free environments around NHS establishments. 8 months without a ciggy has been made a lot easier with vaping and I was very surprised to see my organisation treating vaping the same as smoking.... I was surprised at this. Staff and visitors to our organisation expect vapers to join smokers away from the premises. I feel this is somewhat unfair as to me it makes it harder for those trying to stop smoking with the use of vaping (e-ciggies...). I feel that I have overcome the temptation but feel sorry for those trying to stop. Whilst I occasionally feel like a ciggy (normally when next to someone smoking), I am pleased that I haven't given in to temptation, thanks to the vape. However, I would love to know the opinions of others as to how their NHS trusts have implemented what appears to be an authoritarian approach to Big Brother knows Best... Normally lead by non-smokers. It seems to be that there are mixed messages given out and it would be very interesting to see how different organisations have implemented the policies, with some apparently disregarding advice of Public Health England towards the use of vapes/E-ciggies. It is very encouraging to see the evidence here that our public health recognise the difference between safer nicotine use and the smoking of burnt tobacco. A heavy smoker for over 40 years, I stopped - unintentionally - with an e cigarette at the age of 58 4 years ago. Whilst a smoker I delayed two minor but necessary operations because I was concerned about not being able to smoke whilst in hospital. If vaping is allowed on all NHS premises, I strongly suspect that a great many more smokers may find that they have unintentionally quit, be they NHS staff, patients or visitors. Are you aware that the use of ecigs within hospitals, especially where there is oxygen used is a fire risk? This is why it cannot be allowed with these places. Also, as yet they are not regulated and some may not be as 'safe' as others to those around who breathe in the vapour. An outright case of forced inhumane people's rights,anyone who started smoking 50yrs+ago should not be discriminated against as the Tobbaco companies and government didn't highlight the pitfalls,hypocrites not to mention the risk of smoking enough because their revenue far outweighs the expenditure for smoking related health care?they should still provide a smoke room for patients 62+,definitely agree visitors should be completely banned from smoking anywhere on the grounds,regarding staff that's up to each hospital trust management. I think our health service should not be made a political football by Government and Tobacco Companies who sell these killer drugs while nowadays telling you they will kill you(EXAMPLE you can't take 2x4times daily? ),but for the Grace of God and the vocation he has given the Medical Profession I would not be alive today to thank them all,"The Greatest Caring People"in "Northern Ireland's Health Service"God-Bless them all and long may they be gifted with this great life saving vocation xxxxx. Smoking is a legal pastime, it is not your job to tell or to force people to stop smoking even when you have the power to do so. Smoking is really injurious for health and should stop at very sensitive places. Public health England has a strange way of promoting health in England. But it all comes down to government policy...whenever and wherever you have an establishment that is determined to keep the coffers of the exchequer full at the expense of leading taxpayers to ruin by things like cigarettes, public health will never be as it should. and guess what I saw outside the hospital? People smoking and trails of cigarette stubs strewn across the pavements. I pity those people because they are victims of a long succession of extremely self-absorbed unashamedly corrupt money hungry so called governments that allowed cigarettes to be promoted far and wide despite knowing the risks to health etc. and this is why we are now a nation of abusers/exploiters/ and slaves...the abusers are the shopkeepers who sell the cigarettes and the exploiters are the people behind the cigarette business and the slaves are the people that stand outside hospitals abusing their health by smoking and then walk into the hospital for help with their illnesses. This is what happens when a nation is governed by careless greedy hypocrites. The nation become conscience dead and see nothing wrong in abusing their own health even while standing outside a hospital. And the people that profit from this wicked business are even more conscience dead and don't have sleepless nights even when the death toll from smoking goes sky high. And to add insult to injury I am meant to be falling over myself to vote for another bunch of irresponsible politicians that support this evil business. I agree in 99% of cases. However; a family member was recently sectioned and placed into a secure mental health unit. The patients are currently allowed to smoke in the garden. Many are not allowed to legally leave the premises so it would be impossible for them to go off the premises for a cigarette. It is obviously well known that stopping smoking is a significant stress and strain on your mental health. To place that additional strain on a patient who is already suffering mentally is borderline inhumane. I also don't think that believe that smoking cessation tools eg patches etc take away from the strain. The nurses have a means to go inside and supervise from a doorway so ultimately noone is harmed except those who are already smoking. To the idiots complaining about not being able to smoke outside a NHS hospital - If you want to smoke go off site - if you have a problem with that don't get treated or find another job. Anyone who works at the NHS and smokes on site should be fired. Whatever your views may be, this is likely to be as easy to enforce as excessive speeding, texting whilst driving, littering etc etc. Today at a hospital I visited where I had to run a gauntlet of smokers at the front entrance despite all the signs, told me that their own attempts at enforcement currently result in abuse and even being spat at. Why not provide purpose-built smoking rooms away from the public entrance with a fully sealed and airtight environment where people who smoke can not only enjoy their own cigarette but also everyone else's, like I did today. PS It took hundreds of years for us to realise the ill effects of tobacco smoke, how long will it take to discover the long term "health" benefits of the vaping alternative? Hartlepool and North Tees trust has a no smoking policy which says allows the use of e-cigs on site and grounds in designated areas for staff and patients - However when you ask where the designated areas are on site or grounds you are told there are no designated areas at all. so the policy is just to pay lip service to the quit smoking and support they say they are giving to help patient and staff wishing to quit. As if they do vape they have to go out of ground to stand with other smokers and still get ill from second hand smoke.... why bother putting it in policy if they are not willing to back it up !!! My house is just by a hospital entrance & consequently the smoking area. Summer months are the worse, if I want my windows open the house fills with the smell of cigarette smoke. This cannot be healthy for local residents! I do worry about long term health consequences of this, especially children living in these locations. My house is just by St George's hospital side entrance & consequently the smoking area. Summer months are the worse, if I want my windows open my house fills with the smell of cigarette smoke. This cannot be healthy for local residents! Smoking should be banned on all hospital sites with severe fines for non compliance. The real problem is the ludicrous cost of these cancer promoting products. A packet of fags should be no less than £20. The £16.75 cost being proposed is too low. To be consistent in protecting people from self -harm caused by the things they take into bodies, should we not ban food sales on hospital premises to people who are over weight. I work in a psychiatric unit where smoking a the norm, most of the staffs time is spent lighting cigarettes for patients even though there is a wall mounted lighter outside in the contained courtyard, the activity coordinators spend most of their time going to the shop for cigarettes which reduces the time doing activities with patients. now the patients have been given their own lighters which up until 2 weeks ago was a fire risk. so far we have had one fire lit in a bin and now the patients smoke where they like including bedrooms and communal areas .staff are having to constantly battle to get patients to smoke outside. my concern is passive smoking for staff and patients who do not smoke. A high court ruling said Trusts have a duty of care to protect staff from passive smoking and to take all necessary steps to reduce the risks. i am a non-smoker and feel like im forced to work in such an environment or work elsewhere.